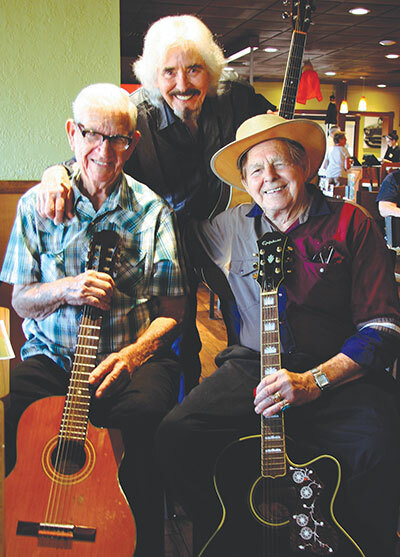 From left, Harold “Guitar Man” Potter with fellow musicians Ivan and Frank Mullins. Lisa Stark photo. Breakfast at Denny’s in Sun City Center comes with a nice bonus on Monday mornings. In addition to enjoying made-to-order omelettes, scrambled eggs, bacon, sausage and pancakes, diners receive the distinct pleasure of listening to the melodious sounds of three of the area’s most talented musicians: Harold Potter, Ivan Mullins and Frank Mullins, who convene at the restaurant each week to entertain family, friends, and local residents. Accompanying Potter are long-time fellow musicians Ivan and Frank Mullins, brothers who have played together for a lifetime and have honed their vocal harmony so well that it seems effortless. Growing up in a family of 13 children, the Mullins “always had music in the house,” a trait they carried on throughout their lives and careers. Ivan, 86, now retired and living in Kings Point, served in the U.S. Air Force for 20 years and used his musical talent to play for the troops in Korea, Germany, Hawaii and Okinawa. He toured extensively around the U.S. and abroad, playing in the European Grand Ole Opry as well the country scene in Nashville. Ivan’s rich, soothing voice is his signature, and makes him a popular performer even today. Each year on Veterans Day, he performs for free at the Riverview Applebee’s for the enjoyment of his fellow veterans. Ivan’s brother Frank also served in the Air Force and was in Korea during the same time as Ivan. Like his brother, he is deeply rooted in country music and has toured all over the U.S., playing classics by Hank Williams, George Jones, Ernest Tubbs and Willie Nelson. Fans at Denny’s regularly make requests for Frank to sing his pleasing version of “Big City” by Merle Haggard, which he performs in flawless harmony with brother Ivan. “We’re here every week to cheer these guys on,” said Ellen Mullins, Frank’s wife. Loyal family and friends arrive religiously every Monday at 9 a.m. including 95-year-old Helen Fernon, Henry and Carole Smith, Ivan’s wife Vickie Mullins and daughter Kim Mullins. 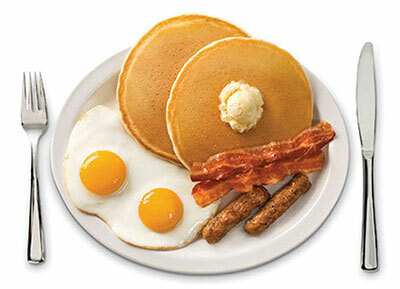 Regular Denny’s patrons sit nearby enjoying their Grand Slam breakfasts and clapping for their favorite country tunes. “Everybody is welcome here,” said Potter, echoing a theme that he seems to have carried with him throughout his entire life. He still lives in the same house in Wimauma where he spent the bulk of his life, raising children Glenn, Laura, Jim and Harold Jr., along with great-grandson Randy McNeeley and a host of other youngsters who ended up leaving broken homes to become part of the Potter family. These days, Harold spreads love in a simpler way: Through his music. In addition to his free performances at Denny’s, he also enjoys strolling the aisles at the SCC Walmart, singing and playing for local shoppers. Denny’s Restaurant is at 3747 Sun City Center Blvd. in Sun City Center, and is open 24 hours a day, 7 days a week. For more information, call 813-633-2400.